Flying with an infant can be stressful, if you let it. It doesn’t help when everyone around you rolls their eyes and audibly “sighs” when they see a wee-one on the plane. I’ve learned to not get worked up by the reactions of other passengers. If I am on edge then baby is on edge, and that is not a good combination. I try to ignore any exasperated looks at the baby on board, and focus my attention just on us. If you let yourself relax, this is one of the easiest ages to travel with. Baby is immobile, can be calmed relatively easily with sucking or snuggling, and doesn’t really need to be entertained. Make it even easier by following my tips for flying with infants! If you are on an international flight ask for a bassinet. You usually need to do this when you book your ticket. They will seat you at the bulkhead and once the seatbelt sign has come off the flight attendant will bring a wonderful baby bed that you can lay baby down in and not worry about disturbing or waking them up. Bring the least amount of carry-on luggage you can get away with. You have to worry about carrying baby around, and everything that goes with that. You don’t want to have any extra baggage to worry about. If you’re bringing a car-set, check-it. If you’re bringing a large stroller, check-it (unless you have a long layover and baby will sleep in the stroller). If you’re bringing a pack-n’play, check-it. You will usually get one or two free pieces of checked luggage with the baby, take advantage of it! Our first flight with Calais at 7wks old. We should have checked the car seat. Lesson learned! 3. Board the plane LAST (if you follow point #2). We were perpetual last boarder before we had kids, and that trend has continued with kids. I don’t see any reason to spend any longer on the plane than absolutely necessary! Add an infant in the mix, and I really want to get on and off as fast as I can. Boarding the plane last allows one last free-space diaper change while the other passengers are boarding, and a few extra minutes of tummy time before baby becomes permanently attached for the entire flight. Whether you are breast-feeding or bottle feeding, having baby feeding for take off and landing helps with ear equalization and helps to occupy time during one of the more turbulent portions of the flight. A good, comfortable baby carrier will be your best friend when traveling with an infant. Your hands will be free and baby will be happily snuggled up against you for the flight. Make sure you try it out at home before you go so that it is not a new experience for baby on the plane. My favourite is the Ergo Performance Baby Carrier. If you are wearing baby in a carrier on the plane (which you should be! ), then check your stroller so that you don’t have to worry about it at the airport. The only exception to this is if baby won’t sleep in the carrier, or you have a very long layover and baby will sleep in the stroller (and give you a break from the carrier). Don’t pack too much stuff!! 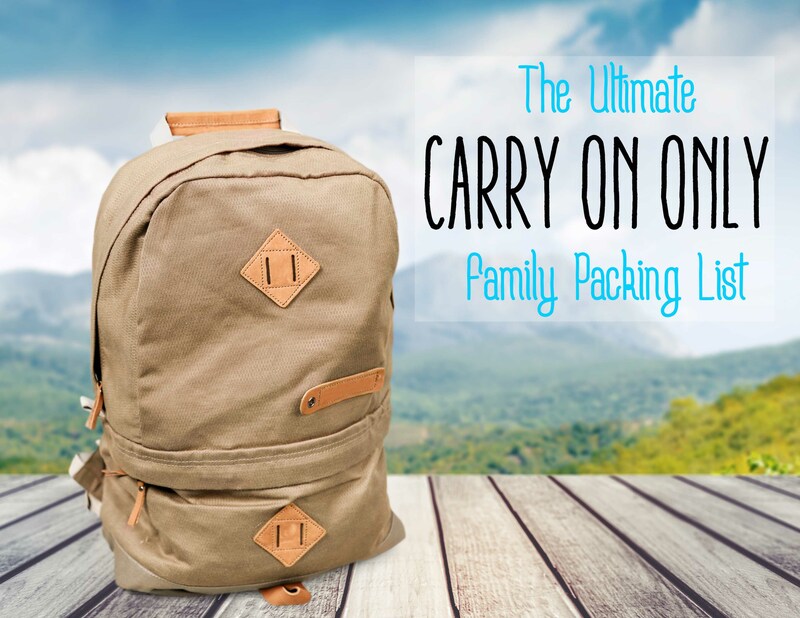 The more you pack, the more you have to carry…get by with the bare minimum if you can. Check out my list of “What to pack for Flying with an Infant” for advice on what to bring on board the plane. What would you include in your own survival guide for flying with infants? Share them in the comments below.